We're up to the third part in our series on Web Analytics and Online Marketing Simulations (OMS). My central thesis is that by emphasizing conversion rates, we optimize our business based on the advertising sources that cause a customer to purchase now. By doing this, we create an inefficiency. We overlook customers who yield a positive outcome in what we deem an inefficient manner. We all know that pay-per-click customers convert at less-than-thrilling rates. We know that pay-per-click customers can be expensive, maybe costing us $0.10 per click, or $0.40 per click, or $0.70 per click. Over time, pay-per-click customers can become e-mail subscribers. And e-mail subscribers often have higher-than-average conversion rates if they click-through an e-mail campaign. And e-mail marketing is really close to free, having virtually zero variable cost. If we want to optimize conversion rates, we'll steer ourselves away from expensive pay-per-click programs with low conversion rates, right? At the same time, we'll want to maximize our e-mail marketing program, with low costs and high conversion rates. 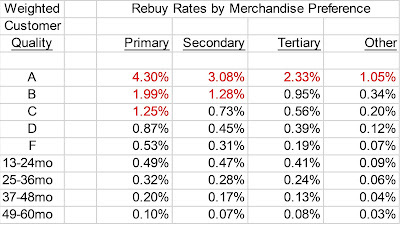 If we want to optimize repurchase rates, we'll take a different action. We want pay-per-click customers, because pay-per-click customers become e-mail subscribers. We want to optimize the multi-year process of acquiring an expensive pay-per-click customer who becomes a profitable e-mail customer. If we optimize via conversion rate, we won't "seed" our business with the pay-per-click customers who become e-mail subscribers with high conversion rates. We optimize our business in the short-term, but create a long-term inefficiency that limits our ability to grow over time. What is the probability of a customer becoming an e-mail subscriber, given that she last purchased via pay-per-click? What is the probability of a customer becoming a loyal customer, given that she has become an e-mail subscriber? What is the probability of a customer buying from multiple channels, given that she has become a loyal customer? By linking each of these conditional probabilities, we arrive at a customer that generates an optimal amount of profit, over time. 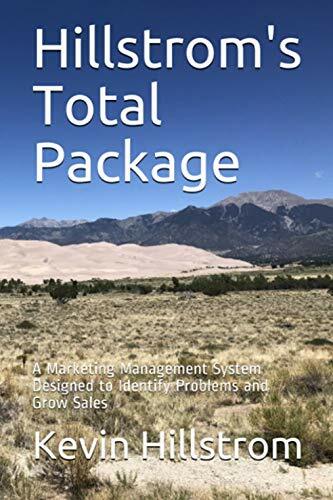 Within each step, we may have numerous instances of sub-optimal conversion rates, but those sub-optimal situations result in a customer that is optimally profitable. We combine conditional probabilities with demand and profit calculations, allowing us to simulate the future based on the actions we manage today. From an Advanced Web Analytics standpoint, we create a table that records customer actions in a prior period of time, and in a future period of time. In the future period of time, we also tag the amount of demand the customer generated in the future period of time. The list of variables below is not exhaustive, and variables can be combined (receive catalog, buy via pay-per-click), creating what I call "micro-channels". Prior Period of Time (1 = yes, 0 = no). Did customer visit the website? Did customer put merchandise in a shopping cart? Did customer purchase from the website? Did customer purchase multiple times from the website? Did customer purchase via e-mail? Did customer purchase via pay-per-click? Did customer purchase via affiliates? Did customer purchase via offline catalog marketing? Did customer purchase via display ads? Did customer purchase via social media? The same set of variables are replicated for a future period of time, along with demand and profitability (if available) metrics. Obviously, the same customer will not have the same attributes, as customer behavior changes. The prior timeframe is usually defined as a year, the future timeframe is usually defined as a year. That being said, there's no reason you cannot explore different timeframes, weeks, months, seasons, etc. However, you identify more inefficiencies, more opportunities for profit, when you lengthen the timeframe. When the dataset is created, the analysis begins. We begin to link the conditional probabilities together, finding customer behavior that leads to long-term sales and profit. In our next blog post in this series, we'll begin to explore how this information comes to life. Kevin, I appreciate the thought put into this post. I've often felt that basing value/roi solely on conversion is short-sighted, but its hard to move beyond it when its typically the only metric readily available. Looking forward to the next post. Thanks for the comments. Things will get a bit more interesting next week.